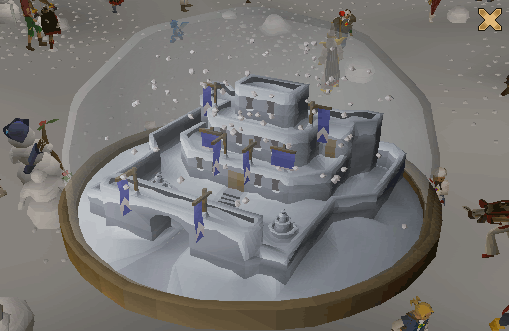 Have you ever wanted to have a RuneScape Christmas where you can build snowmen, make them fight each other and even have real snowball fights? Well, thanks to Jagex, this Christmas is just for you. Like every holiday event, this event is open for free-players and members to enjoy the Christmas spirit of pelting each other with snowballs. Throughout this event, you can choose from 8 items for your snowman. All of these items can't be equipped and will disappear when the event is over. Note: This event was only available from 18 December 2007 until 2 January 2008. Speak to one of the Snow Imps in Draynor Village, Falador, Ardougne, Burthorpe or Rellekka. 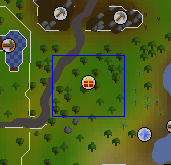 To start this fun packed event, you can either travel to Draynor Village, Falador, Ardougne, Burthorpe or Rellekka. You will know you have found the event because there is tons of clumps of snow everywhere! You can also distinguish it by a Red Present on your mini-map. If you need some help about the event, look for the Snow Imps. They might be hard to see because they are small and everyone is crowding everywhere but don't worry, ask people for their location and you might get there fast. Your task here is very simple. Find the Imp, get a Snow hat, build a snowman, decorate it and enjoy! You might think that isn't very fun and won't last long, but it doesn't end there. Let's explain the first bit more. Head to one of the locations of the Christmas event and find one of the hosts, a snow imp. Snows imps are blue imps that are good and bring snow from the Land of Snow. Talk to the imp and you can then get a choice of some snow hats. The purpose of snow hats are to decorate your snowman. Snow hats don't sound very normal, and they aren't. If you place a snow hat on a fully made snowman, your snowman will come to life! You can choose from Dwarf, Dragon (a favorite), Top hat, Berserker and a Pirate Hat! Note: You may find that people will use a headgear or weapon on your snowman that you are building. Since any one can help build with snowmen and even steal them, you might want to ask an Imp for some headgear before you attempt to make a snowman. Collect some snow from one of the heaps on the ground. The snowballs will appear in your inventory, make sure you have plenty of room. Once you have completed the event and obtain the snow globe, you can shake it and your inventory will be filled up. Right-click any one of your snowballs and select "Build". You will place some snow on the ground and from there, you can start making your snowman. Click "Add To" on your pile and you should place some snow on it and it will get bigger. You will need around 30 snowballs to completely make your snowman, so get busy! Once it says in your chat box "You cannot add anymore snow," it's now time to choose some head gear. 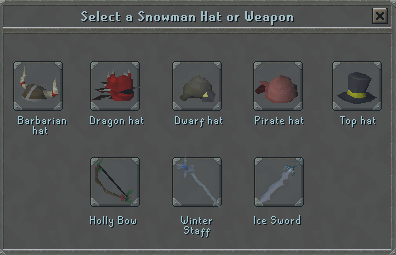 Head over to the Snow Imp ,if you haven't already, and ask for some Snow hats and you will be able to select 5 different hats. Choose as many as you want. Head back to your snowman and use a hat on it and your snowman will spring to life! When you have completely built your snowman, hat and all, you and your snowman will do a little jig and end up talking. From now on, you can do the Christmas Dance emote by simply clicking on it in your Emote Tab. Now you have made your very own snowman, you can venture in to the mystical Land of Snow. Talk to the Imp and ask if you can go to the Land of Snow (you can only ask this after building a snowman) and he will teleport you there. Now you will be in an area the size of Draynor Village but instead of a town, you have a massive field full of snow! Near where you get teleported to you will see a house. There is a Present Icon on the mini-map if you can't find it. Inside the house is the Great Snow Queen herself! Talk to her and you can choose the option of getting a Snow globe of Lumbridge castle. You can shake the globe up to see the beautiful caste in snow and after you stop looking at the globe, snow will fall down on you filling up every one of your empty spaces. If you have your music player on, you will notice that the Lumbridge song is playing at a higher pitch in the background. Now you are free to make more snowmen and pelt others with snowballs, but with some more things to do. Now you can choose to equip your men with either: an Ice Sword, a Holly Bow or a Winter Staff. Head over to an Imp and ask for some Snow Weapons and choose one or more of them. Build another snowman and use the weapon on them to prepare them for battle! If you make a Snow Ranger, Archer or Warrior and some-one else has made another warrior, they will engage in Snow-Combat! To help your warrior through the battle, you can collect snowballs, equip them in the weapon slot and pelt them at your warrior to heal them by 1. You will now you have done this because a Blue 1 will appear on them. Snowmen can do 0-4 damage on another snowmen. Once a snowman is defeated he will melt away and you can build more or have a snow fight will friends or just people in the area. All the Snow-Warriors are level 29 and can't be attacked by players. 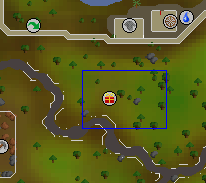 If you ever need to leave the Land of Snow, head over to the Snow Queen or the Imps and ask to be returned to RuneScape where they will teleport you. Whilst participating in this event you can unlock two new songs. 'Start' and 'Land of Snow'. If you help in the making of a snowman, you will be rewarded with the Snow Dance emote. You will get a Snow Globe from the Snow Queen. From now on if you lose your Globe, Diango will give you another one for free in Draynor Village. Now go out there and have some fun! This event is a favorite amongst people already and even though it is short. It's a heck of a lot of fun! From the Team at Sal's, have a Merry Christmas and a Happy New Year.